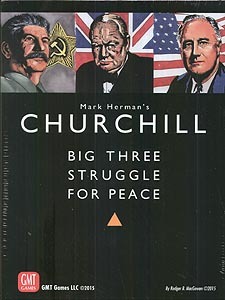 Churchill is not a wargames, buty a political conflict of cooperation and competition between the Big Three. As a world leader (Churchill, Stalin, or Roosevelt) you sit above the fray at ten historical conferences where you debate and decide how to defeat the Axis, while shaping the peace that follows. While Churchill is not a wargame, it gives you a new and unique way to view World War II from the big chair. As one of the Big Three you can now experience the war to defeat Hitler and Tojo yet remain vigilant of your Allies intentions. Each conference has you and your Allies nominate issues that will be discussed and debated. Through a new game mechanic you play staff cards to control the issues that shape Allied strategy. This is all done using a novel game display of a circular conference table based on the one used at Potsdam. You sit in your Chair at the conference table and use your staff cards of named personages, such as Secretary Stimson and Anthony Eden, to nominate and debate conference issues. At all times you have your Leader card (Roosevelt, Churchill, or Stalin) that can weigh in on any issue once, but not without risk. Each time Roosevelt is used he may die and be replaced by Harry Truman. Churchill can have a heart attack and miss the next conference, while Stalin's paranoia may cause a mini-purge of the Soviet staff. The winner of the game is not necessarily the player with the highest score, but the one who acted as a cooperative Ally with the best post war political alignments. Act openly against your Allies or attempt to play the role of an unscrupulous Kingmaker and you will experience defeat. Churchill is played with three or two players, and solitaire.Churchill can be played solitaire using an adaptation of the Fire in the Lake 'Bots that have been so successful in letting you play any time, with any side, with up to three players. Churchill comes with three scenarios ranging in playing time from 90 minutes (training), 2-3 hours (tournament), or 4-5 hours (campaign).